A prominent member of the Democratic Party for much of the twentieth century, Abraham Ribicoff epitomized the notion of the “American Dream.” From his humble beginnings as the son of Polish immigrants in a New Britain, Connecticut tenement, he went on to achieve a successful career in law and politics during which he served as a member of the US House of Representatives and in the Senate, accepted an appointment as the Secretary of Health, Education, and Welfare during John F. Kennedy’s administration, and won election as Connecticut’s first Jewish governor. After graduating from the local public school system in New Britain, Ribicoff began work in one of the city’s many factories, making zippers and buckles. He used the money he earned to further his education, first at New York University (to which he received admittance in 1928) and later the University of Chicago. Ribicoff’s resilience during his formative years, including his willingness to work odd jobs (from factory worker to salesman) earned him the reputation for being a self-made man; a claim that followed him throughout his career. After completing his law degree in Chicago in 1933, Ribicoff returned to Connecticut, passed the bar, and began a career in law. Interested in politics from an early age, it was not long before Ribicoff sought to help shape the direction of his home state. His first foray into politics came in the form of membership in the Connecticut state legislature, in which he served from 1938 to 1942, and then again from 1945 to 1947. In 1952, he ran to fill a vacancy in the Senate but lost to Prescott S. Bush, the father of President George H. W. Bush. He returned to law practice, but two years later, made a successful bid for governor, defeating John Davis Lodge. Ribicoff’s early support for a young Democratic senator from Massachusetts became one of the most enduring elements of his legacy. 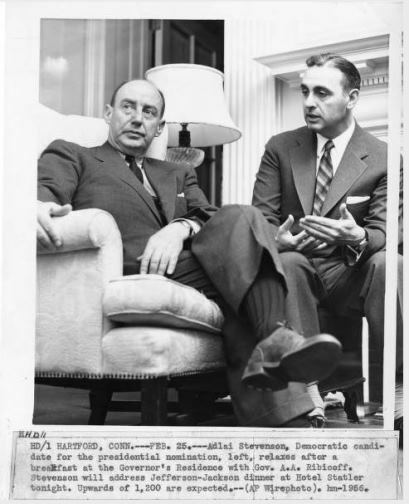 In 1956, four years before John F. Kennedy received the Democratic presidential nomination, and well before many others on the national political stage became aware of the young candidate, Ribicoff and Connecticut’s Democratic chairman, John Bailey, put their political weight behind him. When Kennedy became president, he remembered the early support of his political ally from Connecticut, and appointed Ribicoff the Secretary of Health, Education, and Welfare. After only 18 months, however, Ribicoff resigned his position and made a successful bid for the Senate, in which he served from 1963 to 1981. “Senator Abraham A. Ribicoff: Legislation Sponsored or Cosponsored by Abraham A. Ribicoff.” Congress.gov, 2014. Link. 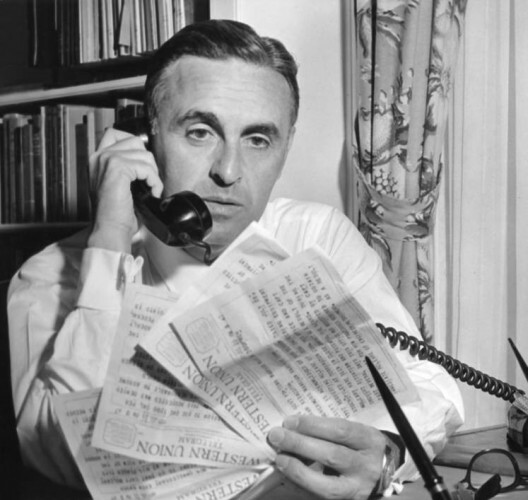 “Finding Aid to Inventory of Records Office of the Governor: Abraham Ribicoff (1955-1961): RG 005:033.” Connecticut State Library, 2009. Link. “Finding Aid to the Abraham Ribicoff Collection.” Jewish Historical Society of Greater Hartford, 2014. Link. “Finding Aid to the Abraham Ribicoff Papers.” University of Connecticut Libraries, Archives & Special Collections at the Thomas J. Dodd Research Center, 2014. Link. “Finding Aid to the Abraham Ribicoff Papers, 1927-1981.” Library of Congress, Manuscript Division, 2014. Link. Ribicoff, Abraham. America Can Make It! New York, NY: Atheneum, 1972. Ribicoff, Abraham, and John O. Newman. Politics: The American Way. Boston, MA: Allyn and Bacon, 1967. “Ribicoff of Connecticut Dies; Governor and Senator Was 87.” New York Times. February 23, 1998, sec. NY Region. Link.